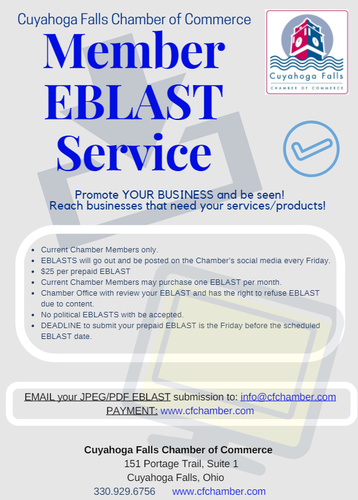 E-BLASTS will go out and be posted on the Chamber’s social media every Friday. Current Chamber Members may purchase one E-BLAST per month. Chamber Office will review your E-BLAST and has the right to refuse E-BLAST due to content. No political E-BLASTS with be accepted. DEADLINE to submit your prepaid E-BLAST is the Friday before the scheduled E-BLAST date.